If you have to work closely with IMS (IP Multimedia Subsystem) then you know that this is most complicated telecom system with tens of nodes, sub-systems, protocols and links. If you don't - please refer to the brief(!) scheme from Wikipedia. It's origin came from past century (at least the year 2001 we have official document already) and based on the concept of converting TDM connections to IP. 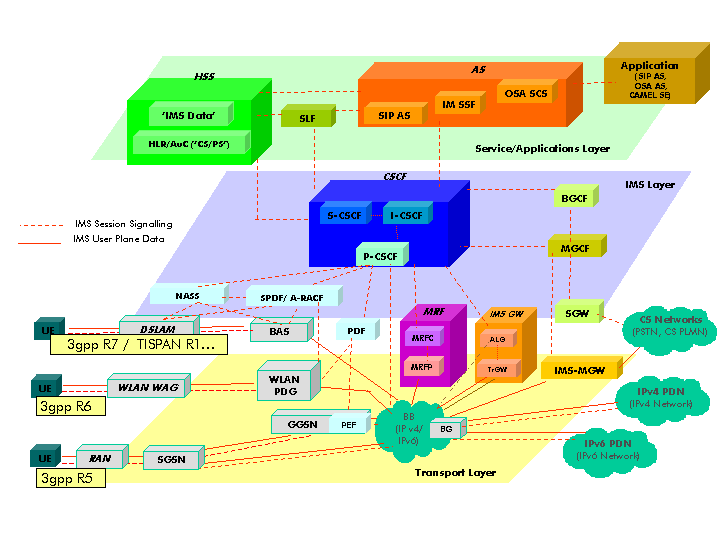 People who have developed this are representing major telecom vendors, major operators, leading institutes and so on. Finally it's considering as is (dogma) and there is nothing to change. But this dogma exactly the case!.. Let's think - what exactly the service of IMS? Call IP to TDM (PSTN/PLMN), call short numbers, video calls, number commands for service. What else?... Ok - call IP to IP but with different codec, may be kind of service unification like SMS send/receive on mobile terminal, fixed phone and from PC. In general there is nothing more. So, the fact is that we have to connect different media (TDM, IP and may be ATM), use several codec and align these for exact connection and then use some restrictions like - if one party have no video device, then only voice call is possible. Kind of things like short numbers, private groups, messaging - all these stuff is poor PC programming. Then what if ...there will be Media Gateway which can connect different media and use different codecs (sure it's quite an expensive node, if we say about Telecom Grade service level and millions subscribers in any network) and some Serving Node for logic. Interact with subscriber's database. Functionality moreless same as VLR - get info about restrictions and implement these restrictions for exact call. There have to be some service database with list of links, types of media, point codes, that Serving node can manage Network restrictions in addition. For example - connection to linkset 1234 is TDM, so we have to use PCM-like codec, meantime DPC is 1-1234 and there is no Video. In fact there can be even some dynamic mechanism for determining restrictions (For example - if calling party is in GSM network, then no video is possible, but if in WCDMA - then possible). But this is just a Feature, not adding new type of nodes! Control Media Gateways. There can quite a complicated scenario of controlling several Gateways of different vendors and with different control protocols, but anyway - it's just a matter of programming and adding one more Feature. Have to generate some CDR-like records. The real thing is that IMS can be just a Software Product for Cluster/Cloud. The Networks already have many nodes for any purpose - split on Switching Server and Media Gateway with support of different signaling, media and codec, HLR, HSS, AAA servers for storing and processing subscribers' data. Therefore all this low level tuning of delay, jitter, bandwidth (in depending on media) are already processing by modern Network. One smart guy like supposed the same 10-15 ago. Technologies at that time was not so developed and distributed to mass market, so this person decided to push idea of complex IMS with multitude of nodes for each function. Ways of promotion - Mass Media, Standardization Institutes, Forums and Communities. Thus key telecom vendors were eliminated as competitors. And now when time of mature technologies came this person will perform it evil plan! With small investments similar to development of typical online game he will engage World Market of IMS! Actually - Why not Microsoft?.. They are Rich long time ago, they act as Main IT company, they are some um... hm... you know, right? ;-) and finally they bought Skype! The last fact is really something of Conspiracy Theory - pay many billions for the company which almost have no income. In addition they have an experience in deal with hardware (XBOX) and can develop Media Gateway if still necessary. - Did you saw the news that Google is going to double investments in Google Voice service? - Oh! Yeah! I saw Maya prophecy that in the year 2666 the will be only one Telephony Operator - GOOGLE and only one Telephony Supplier - HUAWEI. - What? I know that Maya prophecy says there will be the end of the World in 2012! I suppose this idea of single IMS node (which is in fact some software package, even if running on many servers - Cluster or Cloud) as quite reasonable. Even if there wasn't any conspiracy, but all these 3GPP protocols was started in the old time (IP calls only some distant future) and now have to be updated to last technical achievements and models. No any insider information is used in this article.